Yasmeen Ahmed is a British-Bahraini trumpet player and composer and played trumpet Flugel Horn on Andy Mackay's 3Psalmsalbum. Tipped as a rising star by Jazzwise and Time Out, she won great reviews for her debut at Ronnie Scott’s, leading her own quintet and in opening the Jazz In The Round series at the Cockpit Theatre with her vibraphone and bass trio. Since then, Yazz has performed with her small ensembles at the Vortex, the National Portrait Gallery, opened the 2013 Manchester Jazz Festival and more recently performed at the Museum of Modern Art in Kuwait and the Alfa Jazz Festival in Ukraine. 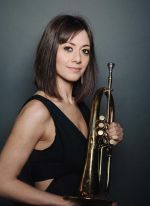 She has played alongside Toshiko Akiyoshi, Kenny Wheeler, Steve Williamson, Courtney Pine, Sir John Dankworth and Troykestra. She works regularly with the Human Revolution Orchestra, These New Puritans and with her septet Ahmed Family Hafla. Yazz has also recorded and performed with Radiohead, Joan As Policewoman, Max Romeo, Lee ‘Scratch’ Perry, the Manic Street Preachers, Swing Out Sister and has toured the world with art-rock band These New Puritans as a soloist and member of their septet and quintet. In November 2012, Yazz was selected by Tomorrow’s Warriors to participate in a cultural exchange project, Interplay, where she collaborated with jazz artists from the UK and Sweden. Her collaborators included Denys Baptiste, Gary Crosby, Samuel Hallkvist, Ira Mogilevsky and Michala Ostergaard-Nielsen. The Hafla band performed at the Queen Elizabeth Hall in November 2014, featuring the premiere of Yazz’s commissioned piece Whispering Gallery, funded by Serious and EFG London Jazz Festival. Yazz was awarded a jazz fellowship from Birmingham Jazzlines in 2014 where she was supported during the course of a year in writing a major new piece of music which was performed in October 2015 at the CBSO Centre, Birmingham. In 2015, Yazz received two commissions from Tomorrow’s Warriors. The first was to create a suite inspired by courageous and influential female role models, premiered by a special all-female line-up of the organisation’s professional ensemble, the Nu Civilisation Orchestra, in the 2015 Women Of The World Festival at Purcell Room, London. The second was a piece for the Tomorrow’s Warriors Youth Jazz Orchestra drawing on tales of migration, family traditions, cultural mysteries and myths in a celebration of cultural diversity and the changing face of post-war Britain. Yazz’s debut album Finding My Way Home, featuring bass virtuoso Janek Gwizdala and clarinetist Shabaka Hutchings, was released in August 2011. The album is a collection of original compositions and improvisations, exploring the sounds and rhythms of Yasmeen’s Arabic heritage, revisiting memories from her early childhood in Bahrain. These are contrasted with pieces reflecting the classic British jazz from the 1950s and 60s, which was the soundtrack to her teenage years and was her gateway into improvised music. Gary Crosby OBE included Finding My Way Home in his top five releases of 2011.